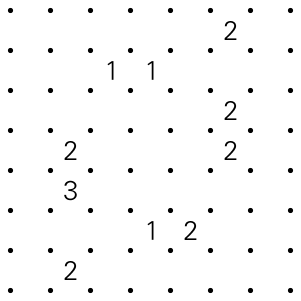 Here’s a Divisor Sudoku. I made this one for the 24h review series on croco earlier this year, but ended up making a second easier one. Please excuse the lazy rendering. Rules Standard Sudoku rules. In addition, the givens indicate a divisor of the corresponding two-digit number (left-right or up-down). This entry was posted in Puzzles and tagged hard, sudoku, sudoku divisors, variant on 2016-08-31 by rob. 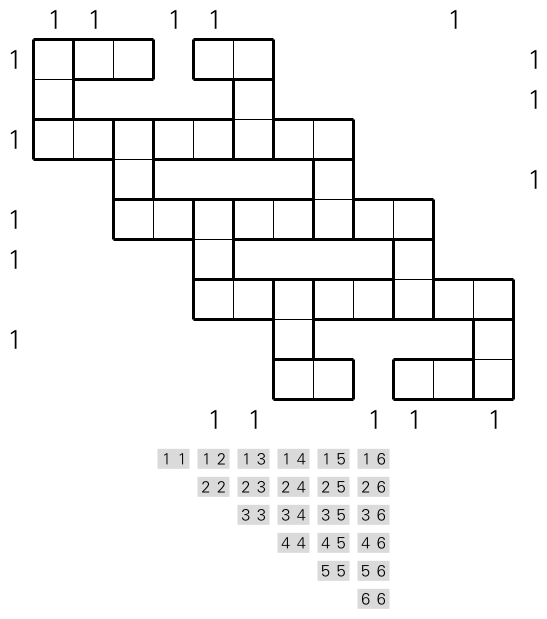 A companion skyscrapers puzzle to puzzle 119. This was the first one I made, 119 was meant to be easier, but still too hard. Buildings of size 1-9 and one park (gap, invisible) per row and column. EDIT fixed shifted clues along the top. This entry was posted in Puzzles and tagged hard, skyscrapers on 2016-08-24 by rob. Here’s something new, a puzzle I made when a friend asked for “something with pipes”. I think the general idea of finding a pentomino net works quite well, though I’m not convinced of the details of the mechanics in this version. 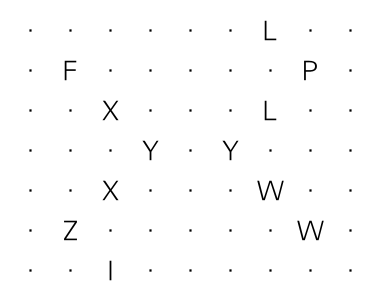 In particular, some other kind of clues might work better, e.g., giving the connection dots. 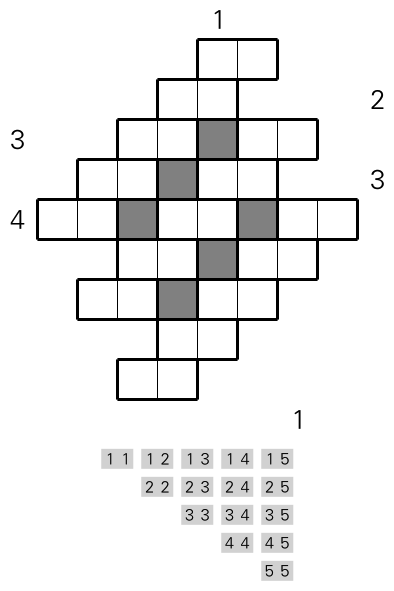 Edit Amended the rules to hack the puzzle to uniqueness. Rules Place a full set of pentominoes onto the grid lines. 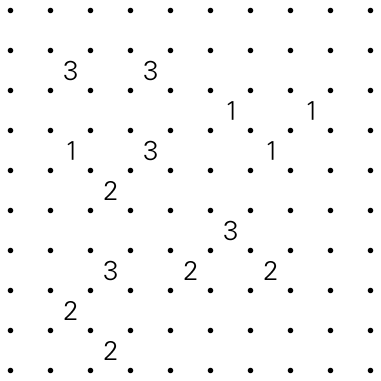 (Each pentomino cell maps to a vertex, and adjacent vertices are connected by an edge, like the clues from Puzzle 82.) 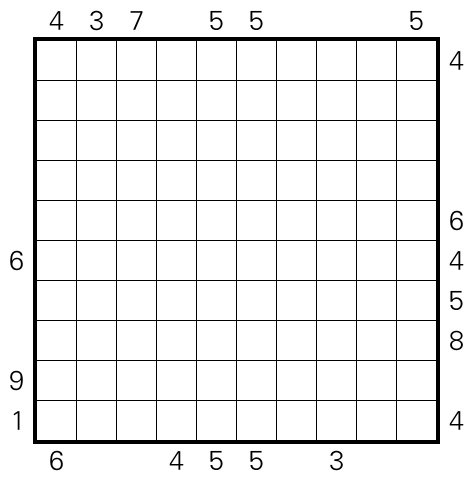 Each edge may be part of at most one pentomino. If two pentominoes touch at a vertex, there must be exactly two pentomino edges touching that vertex. There must not be any vertices with a single edge. Wherever a vertex is marked by a letter, that vertex must be one of the five vertices of the pentomino corresponding to that letter. 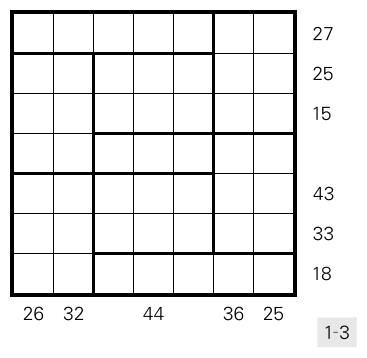 There may be still be a second pentomino using that vertex. 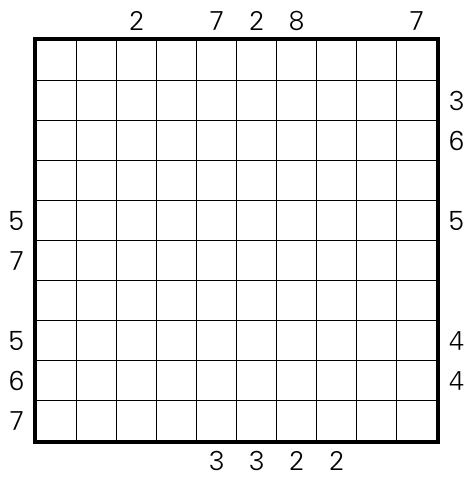 Pentominoes may be rotated and mirrored. Except F: F may be rotated but must be oriented as in the example solution. Example with pentominos F, U, V, Y. This entry was posted in Puzzles and tagged medium, pentomino pipes on 2016-08-17 by rob. Have a Summon. If you’ve already figured out the kind of argument this one is built around it’s not that difficult. This entry was posted in Puzzles and tagged hard, standard, summon on 2016-08-10 by rob. Another Skyscrapers Domino Construction, to bang your head against. If that’s your thing. Edit I’ve since convinced myself there’s a reasonable way through. Still really hard, but no longer a puzzle I feel bad about. Rules Place the given set of dominoes in the marked domino tiles. 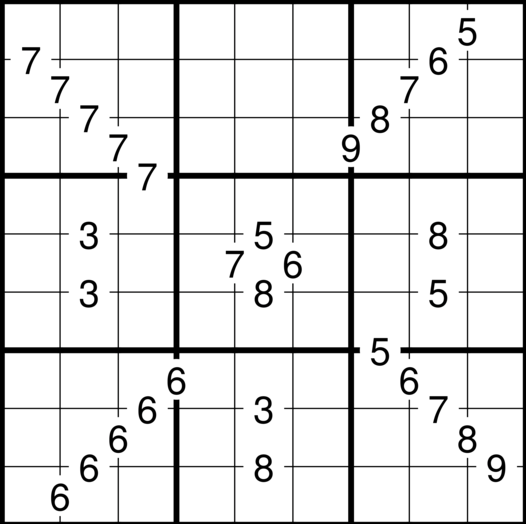 Whenever two dominoes touch by an edge, the adjacent numbers must be the same. Clues outside the grid are skyscraper clues: They indicate the number of visible skyscrapers when looking along the corresponding row or column from that point, where each number represents a skyscraper of that height. Skyscrapers are blocked from view by those of greater or equal height. This entry was posted in Puzzles and tagged domino construction, domino construction skyscrapers, hybrid, preview, too hard on 2016-08-04 by rob. Is it just me, or are there more uncommon types on this round than previously? Anyway, below there’s a Skyscrapers Domino Construction. Again these were on the 24 hours this year. This one is probably not typical, but I think it came out quite well. This entry was posted in Puzzles and tagged domino construction, domino construction skyscrapers, hard, hybrid, preview on 2016-08-03 by rob.